Luka, a 6-year-old, 60lb spayed female Golden Retriever, suffered from heat stroke after being left in a car for several hours during a hot summer day. Heat stroke, also called Hyperthermia, is a condition wherein extremely high body temperature leads to multiple organ failures, collapse, and possible death. Abnormally high body temperatures develop when the body cannot give off heat efficiently, such as in a closed car on a hot day. Luka, an otherwise healthy dog, wandered out of her fenced yard and was picked up by animal control. The animal control officer kept Luka inside a non-ventilated part of the car for almost four hours. 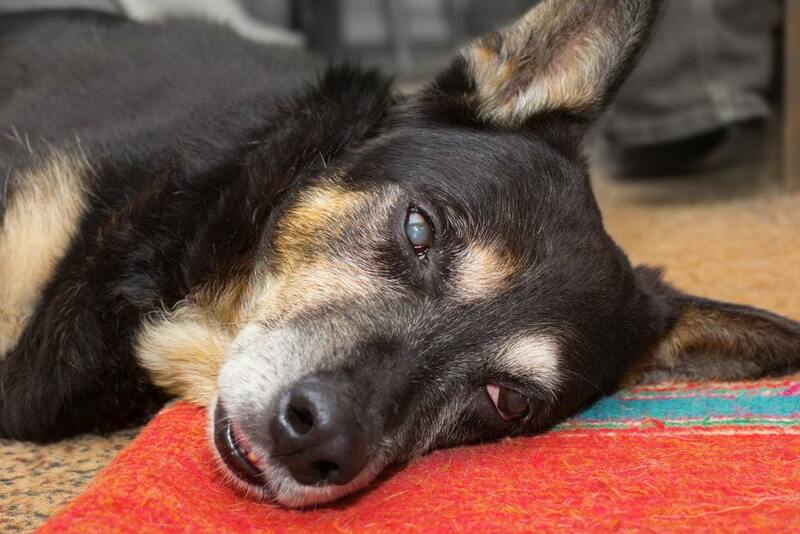 When finally brought to the dog pound, she was weak, unable to stand, barely responsive and dyspneic (breathing with difficulty). She was immediately placed in an air-conditioned car and rushed to a nearby veterinary emergency center. Upon arrival at the emergency center, Luka was examined and diagnosed with heat stroke and vasodilatory shock. She was also dehydrated, had metabolic acidosis, hypokalemia, hypophosphatemia, and hematuria. She was hospitalized in the ICU for two days and received life-saving treatment. She eventually made a gradual but full recovery. Luka was wearing a PetPace collar at the time of her hyperthermia. The collar closely followed the rise in temperature and detected the heat stroke event in real time. The following graph shows the gradual rise in temperature until it crosses into the red zone, signifying hyperthermia. 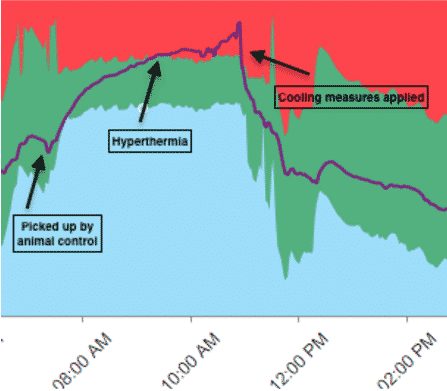 Later, following the application of cooling measures and medical treatment, a sharp drop in her temperature back to the normal range can be seen. *CLOSE-UP VIEW OF THE TEMPERATURE GRAPH SHOWING HEAT STROKE EVENT. HYPERTHERMIA IS INDICATED BY THE PURPLE LINE CROSSING INTO THE RED ZONE.